MIG welders are a hot commodity. Not only do they offer incredible functionality at a great value, beginner welders usually have an easy time learning how to use MIG machines. MIG welders tend to be more economical than TIG or stick welders so the budget-conscious welder might want to look at a MIG welder before investigating other options. 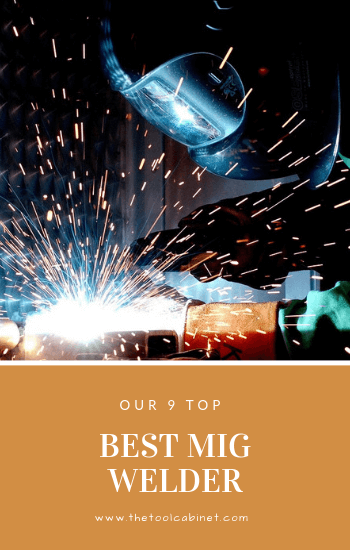 Here we review nine of our favorite MIG welders! Check out the Lincoln Electric K2185-1 Handy MIG welder if you’re looking for a compact, lightweight, portable, and user-friendly MIG welder! The K2185-1 welder works very well for home repairs or hobby projects on light gauge mild steel. The package comes with everything you need to immediately use it! This welder’s dimensions measure 12.8 x 8.8 x 18 in. and weighs about 26 lbs and 46 lbs with everything included. The K2185-1 includes a cold contactor safety feature which keeps the welding wire electrically “cold” until you press the gun trigger. Only then does the temperature increase. It also allows you to more precisely control through wire feed speed adjustment and selectable voltage ranges. Lastly, fan cooling prolongs the life of the welder for years of use. Lincoln Electric manufactures this welder in the United States. Included in the package are a gun and cable assembly, work cable and clamp, gas nozzle, gas regulator and hose, a spool of solid wire, contact tips and hand-shield with filter plate and lens, a spool of self-shielded, flux-cored wire, contact tips, and chipping hammer/brush. All you’ll need to buy is shielding gas. You also purchase a separate cart to hold the welder. This welder can be your best friend for small projects around the house such as auto work, custom fabricating, and other projects. It won’t be able to tackle larger projects so keep in mind that it will not perform like other more expensive welders. The packaging includes almost everything you need to use it except a cylinder of shielding gas. These great features make the welder affordable and a great value, especially if you’re purchasing your first one. The Goplus MIG 130 Welder is a great beginner MIG welder due to its versatility and professional finish in welding, auto bodywork, and other projects involving the processing of thin steel. Its durable construction and plentiful features bring significant value into a small, compact, lightweight design. This machine is excellent for welding thin steel and iron for DIY projects at home and general repair work. The Goplus MIG welder measures 13.4 x 7.3 x 11.4 in. and weighs about 35 lbs. Its voltage is 110V/60Hz. The max open voltage is 37V, and its max output current is 15% at 105 amps. This welder comes with a few safety features such as automatic thermal safety protection and a torch with full on/off safety control. It also has two air vents on the machine to help dissipate heat. This welder is perfect for beginners new to MIG welding. The welder’s portability lends itself well to almost any small home project. The Goplus MIG welder bundles professional-grade durability and value-added features to make this an excellent purchase. Something to keep in mind, however, is that the wire is always live and runs at a high temperature. Be careful handling the material, so you avoid burning yourself. Other than that, its four heat settings, the infinite wire speed settings, and safety features make this welder a beginning MIG welder’s best friend. 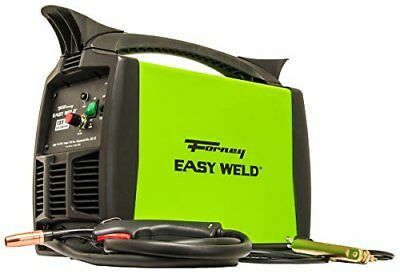 The Forney Easy Weld 299 125FC welder is a basic flux-core welding and MIG machine. The Easy Weld differs from traditional MIG machines because it does not require a shielding gas. This welder makes basic metalsmithing projects such as creating metal art or fixing broken appliances simple and fun for almost anyone, even if you haven’t used a welder before. The manufacturer estimates it will take you a half hour to learn the tool before you’re up and running! The 299 125FC welder welds 24 gauge wire up to a 1/4 in, and it also has a 120-volt input and a 125 amp output. Lastly, it accepts 2 lb and 10 lb wire spools. The welder measures 23 x 11 x 18 in. and weighs about 42 lbs. The welder’s size makes it fairly portable to take around your house or workshop. The packaging includes the following: MIG gun, ground clamp, one additional contact tip, chipping hammer and MIG wire. It does not include accessories, but some recommended ones include more contact tips, welding nozzles, diffusers, anti-spatter spray, and nozzle gel. The manufacturer also lists a starter guide on their website if you have any questions. Although this welder is not meant for heavy-duty projects, it performs admirably for smaller projects like metal fabrication. The welder also welds quite cleanly. Additionally, you do not need too many accessories to effectively use this welder. Unfortunately, the package does not come with a lot of wire so you’ll want to purchase more once you start using the welder. This machine also gives off a lot of splatter. Overall, this welder is a great value for the price you pay and is perfect for beginners who’d like to start welding with small projects. 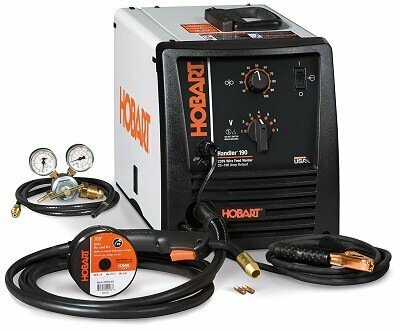 The Hobart 500599 Handler 140 MIG welder is a durable, reliable machine which can handle some of the toughest projects. Do you want to perform auto body work? Would you like to do some heavy-duty house repairs? How about working on farm equipment? The 500599 Handler accomplishes all of these and more! This machine runs on a 115V current, and it can output anywhere from 25 to 140 amps. It welds up 24 gauge wire up to 1/4 in. In mild steel, much like the Forney Easy Weld 299 125FC Welder. The manufacturer recommends the following processes for this welder: cast iron, copper, brass, titanium, and magnesium alleys for both MIG and flux-cored welding. The welder measures 19 x 11 x 13 in. and weighs about 57 lbs. Made of steel, it also has an industrial cast aluminum drive system and a 200 amp heavy duty work clamp. Lastly, you can control the welding arc using a 5-position tapped voltage control selector. Made in Troy, Ohio, the packaging comes with the following: Handler 140 with built-in gas valve, MIG gun with liner, dual gauge regulator and gas hose, work cable and clamp, power cord, extra contact tips, sample spool of flux-cored wire, spool adapter, owners manual, and set-up guide. It also comes with a manufacturer’s warranty in case something happens. The solid construction of this welder means it has a long lifespan for use with years’ worth of welding projects. It’s easy to pick up and use in a short time and works for a variety of heavy-duty projects. We also commend the welder’s professional quality and durability over makers of similar types of MIG welders. The 500559 Handler ranks as a first-rate machine, especially if you’re new to welding. Miller Electric’s 120V MIG/Flux Core welder is a durable, lightweight MIG welder you can carry with you anywhere! This welder is perfect for small projects in your home, small business, or shop. One of the key features you’ll like, especially if you’re new to welding, is the auto-set mode which automatically adjusts your welder’s parameters to the necessary settings. This welder offers two modes of operation: the aforementioned auto-set mode and manual, which allows you to control the machine specifications as you’re working. With the auto-set feature, all you need to do is to set the wire diameter and the material thickness, and the machine takes care of the rest! The angled all aluminum drive system with Quick Select Drive Rolls provides consistent wire-feeding and easy setup, so you have the best, most reliable experience as you’re welding with minimal setup needed. This Miller Electric welder welds mild steel, stainless steel, and aluminum at 24 gauge up to 3/16 in. The input power is 120V. The 120V input lets the welder to be widely used in many locations. Its dimensions measure in at 11.25 x 12.5 x 20.5 in., and it weighs about 51 lbs. The Quick Select Drive Rolls consist of three grooves for various-sized solid wire, and the third one is for a flux-cored wire. The packaging includes the welder, the power cord and plug, an instruction manual, a work cable with a clamp, a gauge regulator, spools of wire, the Quick Select drive rolls, two contact tips, a materials thickness gauge, and hook-and-loop cord wraps. The packaging does not contain shield gas or a spool gun for welding aluminum. We commend this versatile and durable welder from a well-reputed company as a lightweight, powerful MIG welder. The two welding modes give you the control to set your own specifications or let the machine do all the hard work for you! The auto-set mode works great especially if you’re new to welding. The drive rolls offer the flexibility of welding different sized wire or flux-cored wire. Although a well-built machine, this one won’t hold up to the demands of heavy welding. If you need something that will weld heavier metal, you’ll want to choose a different welder. It also does not come with a spool gun to weld aluminum. Lastly, the Miller Electric welder is expensive compared to other MIG welders. If the price is one of your main concerns, you’re sure to find something just as effective at a lower price point. If you’re looking for a welder that can handle the rigors of heavy welding, look at the Hobart 500554001 Handler. The manufacturer designed this wire-feed flux core and MIG welder to handle mild steel, flux core, aluminum, and stainless steel. The versatility and value of this easy-to-use machine makes this an excellent investment for any welder, especially if you’re a beginner. 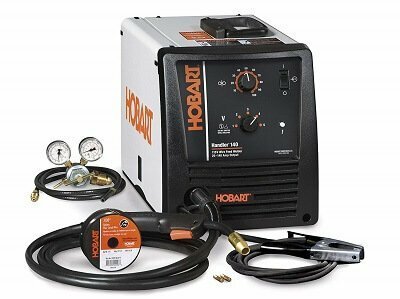 The Hobart 500554001 welder comes with seven voltage selections, a dual-groove quick-change drive roll, enhanced magnetics, and infinite wire speed to give you enhanced and more precise control over your welding outputs. The sheer versatility of this welder allows you to use this for a wide range of projects such as auto body work, farm projects, or home repairs. The 230V welder measures 29.5 x 18.5 x 13.7 in. and weighs 89 lbs. You can weld up to 24 gauge wire to 5/16 in of steel. The output amperage comes in between 25 to 190 amps, depending on your settings. Weld aluminum with an optional SpoolRunner 100 spool gun! You can plug this into the welder and operate this gun without too much additional setup. The machine has a switch so you can easily change between the MIG gun and the spool gun at your leisure. The packaging comes with the welder with a built-in gas valve, MIG gun, dual gauge regulator and gas hose, work cable and clamp, power cord, contact tips, sample wire, spool adapter, and even an owner’s manual and setup guide. These last two items will help you quickly and easily learn how to use your new welder! This particular welder also includes the aforementioned SpoolRunner 100 spool gun. The Hobart 500554001 is a reliable, durable welder great for those looking for a powerful machine with plenty of features. The variety of voltage selections and dual-groove quick-change drive give you plenty of options for tackling all sorts of projects around your home or farm. The added benefit of the SpoolRunner 100 spool gun lets you weld aluminum without needing to buy a separate machine. Note that this welder is primarily for heavier projects and materials – if you choose to weld thinner metals, you might notice some warping if you expose the metal for too long. The Hobart 500554001 falls a little on the heavier side, so it is also not as portable as other MIG welders. Overall, this welder offers both new and advanced welders a solid machine that should last you for years! 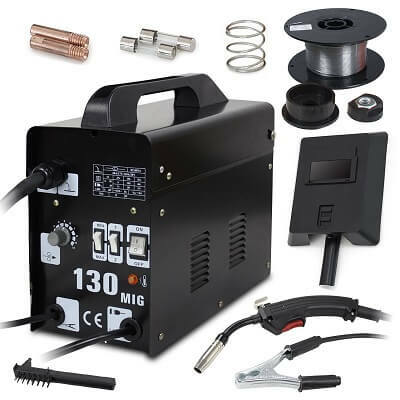 This inexpensive welder by Super Deal combines value with a durable, portable welder. Not only is it ergonomic and comfortable to use, but it also boasts a very user-friendly interface. If you’re searching for your first MIG welder, look no further! 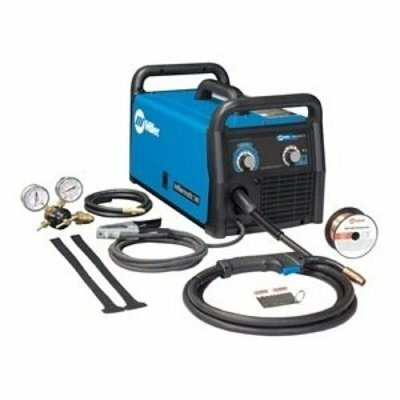 The Super Deal Black Commercial MIG welder uses core-wired, self-release metal-inert gas while welding to prevent oxidation of the welded part. This enhances the finished product’s durability. The welder also features variable feed speed control that lets you easily adjust the flow speed of your wire feed. This machine works for welding mild steel and stainless steel. The Black Commercial welder measures 20.5 x 15.5 x 13 in. and weighs 38 lbs. The 110V welder outputs between 50 and 120 amps. The maximum open voltage is 37V. The Black Commercial welder comes with a copper metal tip at the end of the gun. The copper tip prevents slag from building up. Other build up might occur after a period of time – simply replace it with a spare tip included in the package. Additionally, the AutoMIG control panel user interface provides a clear overview of all settings at a glance. The packaging contains the gun, welding wire, a protection mask, a brush/chipping hammer, extra copper tips, and a ground cord. The Super Deal Black Commercial MIG welder is a great, cost-efficient option if you’re looking to purchase your first MIG welder. Its portability and light weight makes it ideal to use at home, shop, or business. For a new user, its user interface comes second-to-none of any other welder on this list. Easily learn to weld with this machine! Of course, keep in mind that the low price point means that it might sacrifice some quality. The Black Commercial welder works well for small, simple projects. It will most likely not hold up well with tougher jobs or repairs. Also, the lowest speed setting on the feed might run too fast for you. Lastly, the wire is always live so avoid touching it if possible. 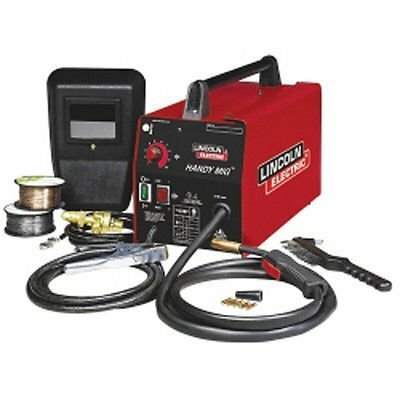 The Lincoln Electric Easy MIG welder comes from Lincoln, a well-known and trusted brand for welders. The Electric Easy welder serves as both a MIG and flux-core welder. Boasting both gas-free flux core setup and gas-shielded MIG welding, this machine easily welds steel, stainless steel, and aluminum. As mentioned above, the Electric Easy welders operate as both a MIG and flux-core welder. 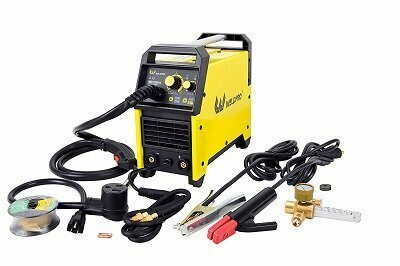 Ideal for home repairs, farm work, light fabrication, and other products, this welder works well around the house or shop. The welder possesses a fully adjustable drive system which reduces wire tangle and crushing. With 208/230V power, you’re able to weld up to 3/16 in. if MIG welding and up 1/2 in. if flux-core welding. Also, this welder weighs around 85 lbs. The manufacturer constructed the Lincoln Electric Easy MIG welder with solid materials. The body consists of aluminum with a rigid drive that assists with aligning wires. Enhanced connectivity occurs as a result of brass-to-brass gun connection. The packaging includes the gun with a 10-ft cable, contact tips, gasless and gas nozzles, a spindle adaptor, shielding gas apparatus, and sample wire. New welders will find this machine durable and constructed of high-quality materials. It’s flexibility as a MIG and flux-core welder with no additional equipment needed unless you want to purchase a spool gun. 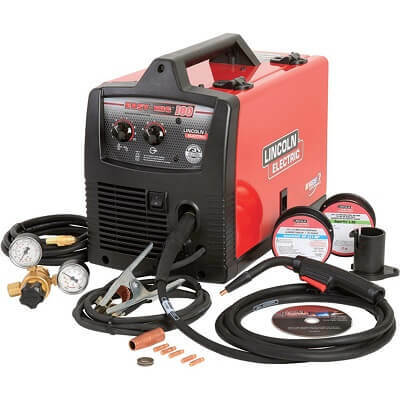 Lincoln is a well-known brand of welding equipment so you can rest easy with the peace of mind that comes from buying from a well-reputed manufacturer. The packaging includes everything you need to use the welder right out of the box! It’s a great value for the price you pay. As with another welder on our list, the heaviness of this welder means it’s more difficult to move around your home or workshop. Additionally, this machine is more expensive than other similar dual MIG/flux-core welders. Lastly, it does not include a spool gun for welding aluminum. This requires a separate purchase. The Weldpro 155 MIG/Stick Welder combines a MIG/flux-core welder with a stick welder to offer unparalleled welding opportunities. 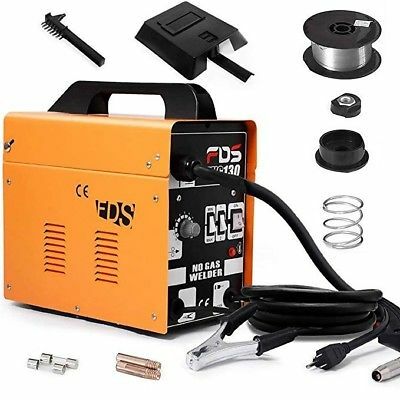 This compact, portable machine is ideal for anyone who’d like to try their hand at a couple of different types of welding. Some innovative features enhance the value of this relatively inexpensive welder! Like other welders, the Weldpro machine comes with infinitely adjustable heat settings and wire feed settings. You can tailor your machine to your exact specifications for a more precise weld. It also operates at two different voltages: 110/115V and 220/230V. This opens the range of projects you can take on! You can easily weld up to 1/4 in. in mild steel and feeds wire at a range of 78 – 472 in per minute. This machine also incorporates safety features with an advanced compact IGBT inverter design. This prevents overheating and provides overcurrent welding protection. The Weldpro 155 measures 15 x 13.6 x 6.7 in. and weighs only 21 lbs. The working voltage is 115V/230±15% with a 30 to 155 amp output. This welder creates less splatter than other MIG welders and does not create any electromagnetic noise! It also lacks tapped controls found on other cheaper machines. The packaging comes with the MIG gun, a MIG torch, an Electrode holder, a cable, a quick connector, clamps, a gas hose, flow meter, a hammer brush, and sample welding and flux-cored wire. All of these will help you use the welder right out of the box! What we love about this welder is its capacity for MIG, flux-cored, and stick welding. Its lightness lends itself well to transporting it anywhere from your home to your office to your shop. The dual voltage also provides numerous opportunities to tackle different projects. Lastly, you can even use this welder as a TIG welder in MMA mode if you purchase optional accessories. This is a true all-in-one machine that’s durable, affordable, and reliable! Unfortunately, the sheer number of features with this machine may prove to be a weakness. If you’re looking for a straight MIG welder that doesn’t dabble in other functionalities, we’d recommend choosing another welder. Although it comes complete with all needed accessories, this welder may be more complex than most beginner welders need or want. What is the Best MIG Welder? All things considered, we choose our favorite welder based on value, features, and overall construction. We find the Goplus MIG 130 Welder to have the perfect combination of all three characteristics. Its stainless steel construction embodies the durability and sturdiness you’d expect from a welding machine. Also, it offers excellent features such as four levels of adjustable speed, portability, and excellent safety mechanisms. Excellent for occasional small projects around the home, the Goplus welder works great as a beginner welder or one for more seasoned professionals or hobbyists. We do recommend, however, looking at other ones in this list if you’re looking a name-brand, heavy-duty welder. You’ll ultimately pay more, but the quality and features will be well worth it. What is the Difference Between a MIG and a TIG Welder? MIG welders differ from TIG welders in several ways. The primary difference stems from the welding process itself. MIG welding uses continuously fed wire whereas TIG welding employs long welding rods that feed into a weld puddle. Both processes can weld various types of metals, but MIG welding tends to be faster and less precise than TIG welding. Welders like to use TIG welding to create aesthetically-pleasing pieces (besides normal repairs and other welding uses); MIG welding is usually more utilitarian in purpose. The MIG welding process appears as a much more approachable process for beginner welders to learn. Not only are most MIG welders easy to use, but they also come with almost everything you need to start welding right out of the box. The ability to weld thinner materials such as steel, aluminum, and stainless steel offers another advantage. MIG welding also produces the highest welding speeds possible, gives the welder precise control on thinner metals, and makes cleaner welds with little to no slag to clean up. Finally, MIG welding balances labor input and product output. That is, you don’t need to work too hard to produce quality products. As a whole, MIG welding comes off as an economical welding process. Establishing a budget will determine the brand and quality of MIG welder you’ll buy. Our list features some excellent values that combine the best of functionality and features and value. But if you’re willing to spend more on a good machine, then it might be worth it to purchase a brand name machine. We’ve included a few of those in our list as well. Some manufacturers in our list specifically created their MIG welders to stand the test of time with durable construction and materials. If you’re hoping to make welding a consistent thing (or if you do so already), consider purchasing a heavier, sturdier machine that will be able to work for long periods of time. If you don’t use your welder much, then we’d recommend looking at one of the more budget-conscious welders in our list. They might not be as sturdy as some others, but light use should see them lasting as long as their other counterparts. Choose a light MIG welder if you’re hoping to take it with you wherever you go, even if that means carrying it around your house. Purchasing a heavy welder you’d like to use everywhere not only can damage your back, you’ll probably waste time trying to navigate it to your desired space without a cart. With a lot of the listed MIG welders, you won’t sacrifice power for weight – many of them will operate on a pretty similar level. Consider how much power you’ll need for your welding projects. If you only need something that puts out light amps, it makes sense to purchase something that fits a smaller target range. Consider your future uses though too – if you think you’ll want more power in the future to tackle larger projects, then making the investment now in a dual-voltage machine or something with more power will make things easier in the future. In this article, we listed some of our favorite MIG welders and gave you some information on MIG welders, their advantages, how they differ from TIG welding, and some things to keep in the back of your mind as you shop for MIG welders. MIG welders might seem like a dime a dozen, but with some careful research, you’re sure to find something you like! I hope you found our Best MIG Welders article useful. Do you have any other questions about any other MIG welder brand?